Direct selling advertisements: Quebeckers prefer them in a plastic bag. According to a 2006 survey of Canadians’ “welcomness of direct selling advertisements” by Canada Post, Quebeckers are significantly less likely to welcome DRTV ads, the shopping channel, addressed mail and telemarketing as means of direct selling. However, they open their door – literally – to unaddressed direct mail. 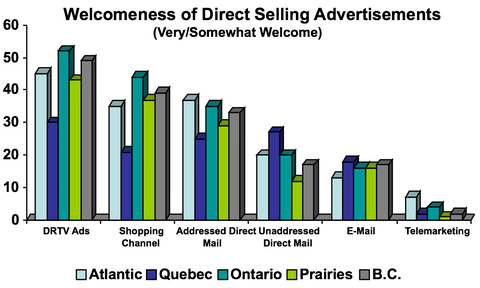 Much of Quebeckers’ receptiveness to unaddressed mail might be traceable to Transcontinental’s door-to-door distribution of advertising material through its ubiquitous Publisac. It delivers an average of 60 million advertising items a week to three million households. That’s an awful lot of plastic bags at a time when some municipalities are banning them. Transcontinental is apparently planning to address the issue this spring with a biodegradable bag that should disintegrate within 6 o 8 months.